Oracle Food and Beverage celebrates its double 40th birthday this year: in 1977, MICROS was founded to bring technology innovation to the restaurant industry, working with restaurants and hotels to change the way that guest service is delivered across the globe. Oracle was also created in 1977, becoming the world’s second largest software vendor and a world leader in cloud technology. Oracle acquired MICROS in 2014. 1) Company stability: You don’t have to worry about your technology vendor going out of business and leaving you high and dry with Oracle Food and Beverage – we’ve been around for 40 years and we’re not going anywhere. 2) Product stability: Get reliability and dependability from software and hardware developed from years of experience and knowledge. We have restaurant customers who choose our solutions time and time again to stay current with their technology. 3) Industry expertise: We have 40 years’ experience of working with restaurants, bars, coffee shops, hotels, stadiums, theme parks – we know your industry and we design technology that is tailored to your needs, whether you are opening your first location or ten thousandth! 4) Local resources: We have a network of local sales representatives who know your market and can help your business to excel. 5) Leader in cloud technology: More and more restaurants are moving POS to the cloud to take advantage of the many benefits. With Oracle you get some of the best cloud POS solutions on Oracle’s own cloud infrastructure. We own all of the parts including the datacenter, meaning that you only have to call one vendor! 6) High security standards: Help protect your data and increase your ability to avoid the fall-out of a cyber-attack. Backed by 19 data centers, an army of Oracle-badged cloud security experts, and around-the-clock monitoring and support, Oracle Cloud security features help safeguard your data (and your customers’ data). 7) Innovation through partner services: Take advantage of a whole range of services from trusted third-party technology vendors that are integrated into our platforms. Looking for an Online Ordering solution or to upgrade to EMV? Explore new revenue channels thanks to innovation through integration. 8) R&D dollars: We want our customers to have the latest and greatest (and most advanced) technology solutions. Oracle has and will continue to invest millions of R&D dollars into building the best technology for the restaurant industry. Don’t believe it? We publish our quarterly reports here. Take comfort that you are utilizing the best technology out there! 9) Always looking towards the future of your business: Stay ahead of your competition with us. Food service is an ever-changing industry and we are always thinking about future needs and developing technology to meet those demands. 10) We own and operate our own cloud: Operating our own cloud (and not using a cloud run by a third party) allows us to provide greater flexibility and enhanced security features to you. 11) Investing in future F&B talent: Staff recruitment and retention are big challenges for our industry and we are actively helping to train the talent of tomorrow. We are proud supporters of the National Restaurant Association Educational Foundation and its ProStart Program, which educates 140,000 students every year to prepare them for the restaurant industry. 12) Global distribution network: Get what you need, when you need it. With a global distribution network, we can ship products and parts quickly and efficiently. 13) 24/7 phone support: With support centers all over the globe, we can help when you need it. We know that a restaurant doesn’t operate only Monday through Friday 8am to 5pm. 14) Web support: We know that you’re busy and may not be able to sit on a phone with a support technician, so online support is also available. 15) Investment in industry research: Stay in the know with Oracle Food and Beverage! We’ve invested in industry research every year, both to help us understand changing guest preferences and needs, and to help you. Recent reports cover topics like loyalty, millennials, and cost control! 16) One-stop shop: Get everything you need from one technology supplier - software, hardware and peripherals - all designed to work seamlessly together. 17) Purpose-built products: Hardware that is built to withstand some of the hottest kitchens and coldest stadiums, with software that is designed to make training of recruits as fast and easy as possible in an industry with high staff turnover – everything we do is built with you in mind. 18) A full product range for your needs: We have you covered with a product portfolio that encompasses every type of technology that would be needed in a restaurant operation, from front-of-house POS to reporting to workstations and tablets...all designed to make and save you more money! 19) On-premises and cloud solutions: Not ready for the cloud? We offer traditional on-premises solutions for your restaurant, too. And when you are ready to move to a modern cloud solution, you can leverage the investment in your existing system to get there. 20) Scalable: Whether you operate one location or a multi-national brand, we can support your needs today and as you grow. We know the challenges of growing from one location to two, or two to five, and our solutions are ready to support you. 21) Payment choice: You can pick the payment vendor that best suits your business. With some POS providers you are not given this choice, which means they are ultimately taking more money from you in the long run. 22) Configured to your needs: We understand that every business is unique and our solutions are designed to be configured to fit your restaurant’s needs. 23) Get access to eLearning for staff and manager training: Get more out of your technology solution with our low-cost eLearning subscription program. Turnover in the restaurant industry is high so we make our training available on demand! 24) Gift & Loyalty: Extend your POS solution when the time is right with a loyalty solution that is fully integrated. 73% of guests say that loyalty program rewards must be relevant. Our Gift & Loyalty solution allows you to get to know your guests and tailor your promotional offers for specific audiences. 25) Reservations Management: Let your guests see real-time availability and request reservations directly from your website. Convenience and simplicity boost customer satisfaction. 26) Reports on your phone: The InMotion app available on the Apple and Google App stores, gives you access to sales KPIs and other data anytime, anywhere, allowing you to keep an eye on performance even when you’re not on site. InMotion is included with the purchase of our Reporting & Analytics package and brings a modern cloud tool to those still using an on-premises POS. 27) Go mobile with the Tablet 720: Line bust and reduce wait times for your guests by modernizing your operation with our 7” tablet POS solution. The Tablet 720 also helps boost upsell to ultimately sell more product. 28) Enable transactions anywhere with the slim Workstation 310: Our smallest workstation ever features all-in-one portability and wireless for anywhere anytime transactions so restaurant operators can serve more guests in the same space. 29) Integrated kiosks for guest self-service: Kiosks offer unmatched versatility. They can be deployed in virtually any kind of grab-and-go setting. Restaurants are increasingly relying on kiosks to decrease labor costs, speed up the order process and reduce wait times for guests. 30) Control labor costs: Labor costs account for a quarter of a restaurant’s revenue. Help forecast and control your labor costs and optimize staffing levels with our labor cloud solution. It also helps you keep up with changing government labor legislation. 31) Control inventory costs: Food cost accounts for 25% or more of revenue. Help forecast and optimize your stock with a system that provides a look at full recipe and product-costing capabilities at a single property or across an enterprise. 32) Intelligence at your fingertips with Reporting & Analytics: Improve operational visibility with a cloud solution that organizes and consolidates data from every location in real-time into easy-to-view reports. 33) Monitor potential fraud with XBRi Loss Prevention: Help combat fraud and better protect your assets with the ability to quickly identify fraud incidents and collect evidence. XBRi is also a great tool to help provide fraud training. 34) Maximize kitchen performance with Kitchen Display Systems: Help reduce chef errors, enhance food quality and increase speed of service! The optimal solution for increasing kitchen efficiency, fully integrated with your POS. 35) Increase margins with Data Science: Want to dig into your data and find patterns for cross- and up-selling and forecasting? 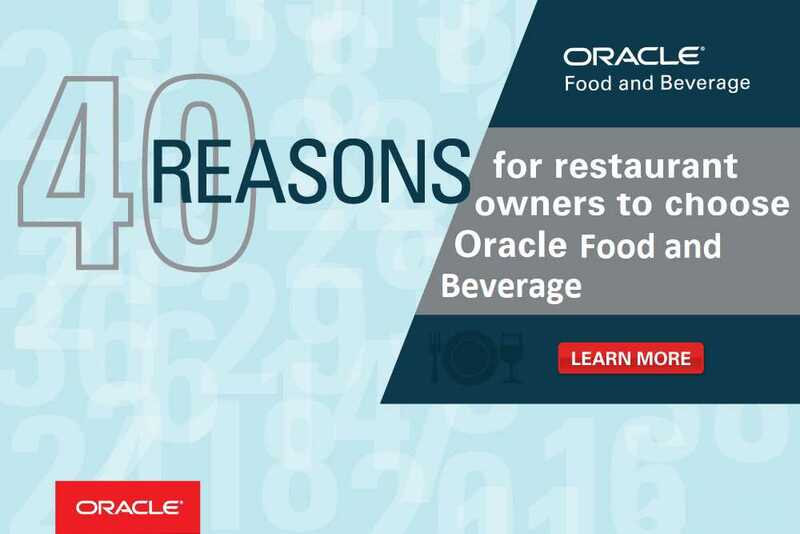 Oracle Food and Beverage offers access to the latest machine learning technology and expert analysts to find simple ways to increase your margins. 36) Utilize best in class hardware with the Workstation 6 Series: The latest model from our durable, resilient workstation series. Choose from three types of sleek yet rugged POS terminals that deliver superior performance and maximum efficiency. No more bulky terminals! 37) Automate with Venue Management: For sports and entertainment venues, Venue Management automates and makes inventory and cash management more efficient. 38) Manage your suites better: Specifically designed for sporting and event venues, Suites Management enables you to manage suite operations, stay in contact with your customers and optimize workflow. 39) Venues can go portable with our Mobile POS Client: Cut wait times, line bust or provide in-seat ordering in a stadium operation with a battery optimized mobile device. 40) Great team of people committed to be your partner: Our knowledgeable and caring team will help ensure your business success – we’re always here to help!